1837 Coluber (Homalopsis) prevostianus Eydoux & Gervais, Magasin de Zoologie, 3:5, pl 15. Holotype: Location unknown. Type locality: "Manila." Collector: unknown. 1849 Gerarda bicolor Gray, Catalogue of Specimens of Snakes in the Collection of the British Museum, p. 77. Type locality: "West Indies," from Mr. Launa's collection. This type locality is in error. Holotype: BMNH 1946.1.2.33. 1854 Campylodon prevostianum - Duméril, Bibron and Duméril, Erpètologie Gènèrale...Reptiles, 7:946. 1884 Helipophis flavescens Müller, Verhandlungen der Naturforschenden Gesellschaft, 7:286. Type locality: "East Indies." Holotype: NMB 1771. Collectors: G. and F. Müller. 1890 Gerardia prevostiana - Boulenger, Fauna of British India...Reptilia and Batrachia, p. 379. 1930 Gerarda prevostiana - Smith, Bulletin of the Raffles Museum, 3:62. Wall (1921) stated that this species was named in honor of Monsieur Prevost, Superintendent of the Paris Museum at the time specimen was named. Gerarda prevostiana is distributed in coastal areas from the vicinity of Bombay, India westward to the Philippines, this distribution may be discontinuous. While it seems probable that it is present in Indonesia I have seen no specimens or literature references to specific specimens that suggest its presence there. It also seems absent from tropical coastal China. Manthey and Grossmann (1997) have a map that suggests it is restricted to the west coast of Myanmar, Thailand, and the Malayan peninsula; however Taylor’s (1965) specimens (a series of 15) were collected in Chon Buri Province along the coast of the Gulf of Thailand. Iskandar and Colijn (2001) consider it present in Indonesia but list no specific localities or specimens and they list the Philippine type locality as an error (probably following Gyi’s comments). However, Auth et al. (1990) verified that it is indeed present in the Philippines. The verification of its presence in the Philippines took 153 years (Murphy and Voris, 2002). The distribution may be disjunct but this snake should be expected wherever mangrove forest is found. Due to its secretive habitats it has been considered rare by many authors, but because of its habits it cannot be easily deleted from a faunal list from any area with mangrove forest between Bombay and the Philippines. However, the apparent total lack of specimens from Indonesia is puzzling. Its distribution overlaps with several other widespread coastal homalopsids, including its sister species Fordonia leucobalia and members of the genus Cerberus, except that Gerarda is absent from the Sahul Shelf (Australia and New Guinea). This is a small homalopsid with a dorsum that is uniform gray-brown or black. The nasal scales are separated by an internasal scale, and it has 17 rows of dorsal scales at midbody, the lowest count of any homalopsid. Its scales lack keels or striations, but may be pitted with irregular erosions of the scale surface. Its close relative, Fordonia leucobalia has 23 - 27 rows of dorsal scales at midbody, but it also has smooth scales and the nasal scales separated by the internasal. Cantoria violacea and Cantoria annulata also have smooth dorsal scales (C. annulata females and juveniles have weakly keeled scales on rows 1 - 4 in the area of the vent) and the internasal separating the nasals. However these two snakes have 21 and 19 rows of scales respectively at midbody. Heurina has its nasal scales separated by the internasal and 27 scale rows at midbody; but it has a completely divided nasal scale. And, Bitia has its nasal scales separated by the internasal but it has 37 - 43 scale rows at midbody that are triangular in shape and have exposed skin between them. Boulenger (1896) gave its maximum length as 520 mm. Twelve specimens were measured for this study; the largest was a male with a total length of 514 mm, and a 65 mm tail. The largest female had a total length of 472 mm with a 57 mm tail. The smallest specimen examined had a total length of 230 mm with a 29 mm tail. 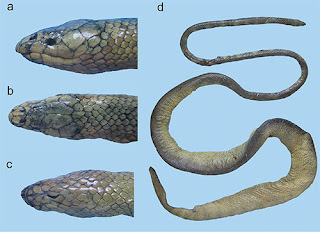 An examination of 12 museum specimens from the eastern portion of the range (India to Thailand, five males and seven females) suggest that the tail/SVL ratio tends to be higher in males (14.4 - 17.6), than in females (13.7 - 15.8). This was also supported by data collected on the Singapore population by Karns et al. (2002). The head is slightly distinct from the neck and slightly depressed. The body is cylindrical to slightly depressed. The eyes are dorsolateral, but more lateral than dorsal. On the head the rostral is a constricted rectangle, about twice as broad as high, and is barely visible from above. The nasals are entire and separated completely by a large internasal that is equal or greater than the nasals. The internasal is not in contact with the loreal. The prefrontals are about equal to the nasals in size. The frontal is relatively short, its length being less than the interorbital distance, and the eye-nostril distance. The parietals are long, about 1.2 times the length of the frontal. The loreal is about as long as high, and in contact with the first three labials. The supraocular is close to being rectangular. The preocular is single and taller than long. There are two postocular scales (rarely three), the upper one is smaller, and the lower scale partially underlies the orbit. There are no subocular scales. The temporal formula can be 2 + 2 or 1 + 3. The upper labials number seven or eight, the fourth labial enters the orbit. 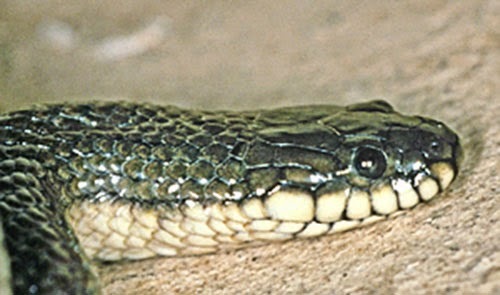 The head shields on these snakes are imbricate and are frequently pitted or eroded. On the chin the lower labials number 7 - 9, the first four (rarely five) are in contact with the anterior pair of chin shields. Gulars number three to five, usually five.